UPR now offers the very best patented catch can system for any application. 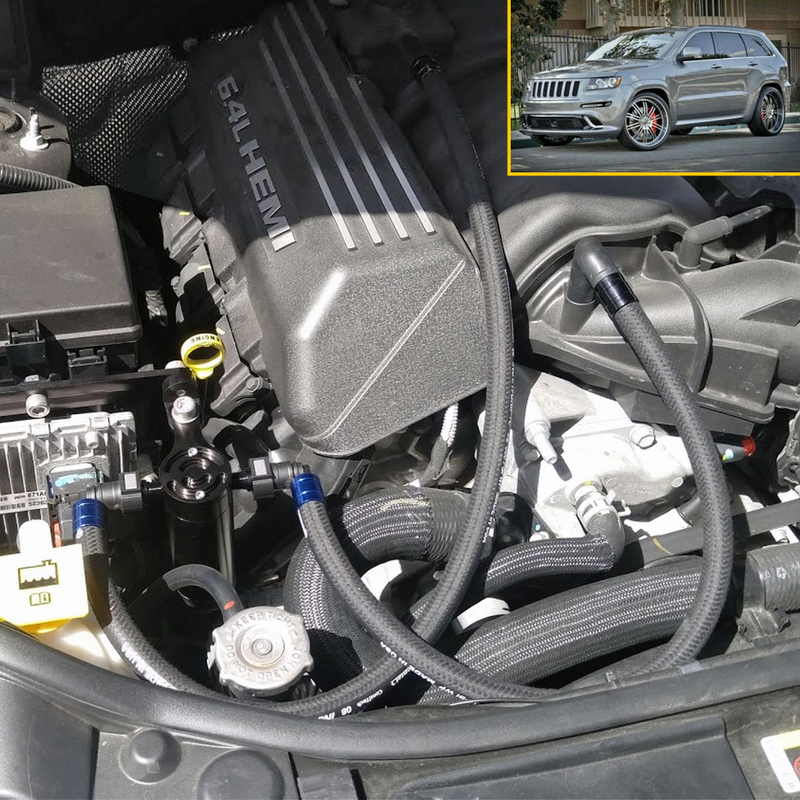 Designed to be an exact fit on 2011-2020 Jeep Grand Cherokee SRT8 6.4lL and Dodge Durango 5.7L. This system will eliminate oil from entering your intake by engine blow-by, which channels oil and trash into your direct air stream from the valve train. This is a common problem on both brand new and especially older engines, which just suffer more from blow by due to wear and tear. The most common problem is making your car emit light blueish white smoke upon start up or even during normal driving. The throttle body handles your main air stream and has a breather tube running from the crankcase to the throttle body. The vacuum from the incoming airstream and positive pressure in the crankcase combine to get oil in the air tract. Every car and vehicle is set up this way to help eliminate the pressure build-up in the bottom end of your engine enabling the piston to move up and down with less resistance. The UPR catch cans feature a Multi-Stage Multi Chamber containment system that delivers the best coalescing and condensing of oil fuel and moisture that get sucked through the PCV to be properly captured and contained through the patented flow process that has been tested to be the best oil separator system in the industry. These new catch cans are one of the most needed performance and protection enhancements for the demand of the modern day PCV systems. We have had thousands of customers install our new Patented UPR Catch Cans and get immediate results in both idle quality and vehicle performance. Another key problem caused by oil in the intake is that it reduces the octane of your fuel and causes detonation especially in turbo, supercharger and nitrous applications. UPR is the largest aftermarket catch can manufacturer in the country. Continually improving our designs to stay ahead of the competition and give you the cutting edge technology of tomorrow today. We are so confident we offer an unconditional warranty on our products to let you know you can always count on UPRproducts. ï¿½ Can Measures 2.25" x 6"
2011 2012 2013 2014 2015 2016 2017 2018 2019 2020 Dodge Durango 5.7 Jeep SRT8 6.4 2011 2012 2013 2014 2015 2016 2017 2018 2019 2020 Jeep Grand Cherokee 5.7 No one else can stack up to the bold clean styling of our aftermarket Billet dress ups, Street Strip & Racing Suspension & Performance Parts for your late model American Muscle Car!